5 1/2 x 3 1/4 x 1 3/4 in. At the peak of the whaling industry in 1800s New England, working and retired seamen developed and practiced making functional and decorative objects from salvaged parts of the whale skeleton. Scrimshanding was a way of passing the time on long whaling voyages. It persists into the present time. Ever since the Marine Mammals Protection Act of 1972, modern-day scrimshanders must either find antique whalebone or ivory or use composite materials. 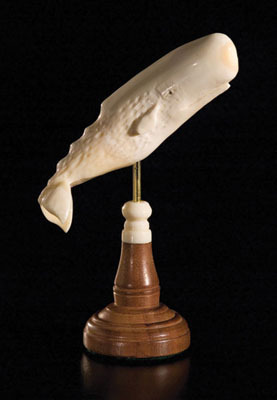 Michael Vienneau used antique whale ivory from pre-1972 stockpiles to make this carved whale. Notice how the tale curves slightly? This is the hollow part of the tooth. In 1990, after sixteen years of working and selling his work in several local galleries, Michael opened his own, called The Scrimshander Gallery, located on Old South Wharf, Nantucket.